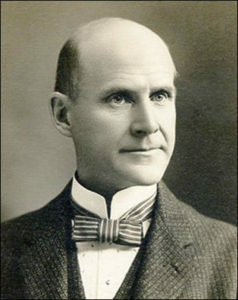 Eugene Victor Debs was born in a family which had migrated to the U.S. Mid-West from Alsace. His father came from a Protestant family devoted to social reform. Thus, he was given his name from those of two writers who were well known for their social reform writings: Eugène Sue and Victor Hugo. From the same Alsace family came his cousin Albert Schweitzer of “reverence for life” fame. Although his parents were relatively well off in their Mid-West American context, Eugene Debs dropped out of school at 14 years of age and went to work on the local railroad. He realized quickly that the railroad workers were exploited and worked in harsh conditions. Thus, he joined in the early efforts to organize the railroad workers. Although he had only a primary school education, he had a natural talent for speaking and writing. He rose quickly to leadership in the newly formed Railroad union. In 1894, he was a leader in the American Railway Union strike. President Grover Cleveland called out the U.S. Army to break the strike under the pretext that the train strike was preventing the delivery o mail which is a federal crime in the U.S.A. Debs spent six months in prison and used his time to read. He was ssent books by socialists living in the U.S. including a copy of Karl Marx’s Das Kapital. Debs left prison with the conviction that socialism was the reform of the future. His socialism was heavily colored by his Protestant faith although he was never active in church movements. The 1920 election campaign was particular in that he ran his campaign from his prison cell in Atlanta, Georgia. Debs was very opposed to the U.S. entry into the First World War – ” a war to benefit capitalists”. He called on men to refuse military service. When the U.S. entered the war in 1917, Congress passed a very harsh Sedition Act. In 1918, Debs was sentenced to 10 years in prison under the provisions of the Sedition Act. Anticopyright: Editorials and articles originated on TMS may be freely reprinted, disseminated, translated and used as background material, provided an acknowledgement and link to the source, TMS: Eugene Victor Debs (5 Nov 1855 – 20 Oct 1926): An Early U.S. Socialist Voice, is included. Thank you.